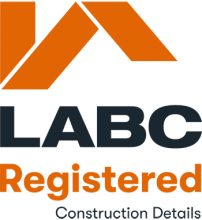 The LABC Details are the first to offer specifiers, designers, SAP assessors, builders and building control teams a combination of specific detail, good practice and points to watch, together with BR497 modelled Psi-values (explanation of Psi-value - SAP software uses Psi (Ψ) values (W/mK) to calculate a Y value (W/m2K) for use in the SAP 2012 software calculator to account for the effect of none repeating thermal bridges at openings and junctions). Registered Construction Details are developed by LABC in conjunction with industry partners, the Modern Masonry Alliance and the Concrete Block Association, offer the ability to design out thermal bridging, assist the assessor in thermal modelling, guide the builder on site and ensure an effective inspection regime to prevent poor performing buildings and enshrine faith in Energy Performance Certificates. Raise industry confidence in your product as well as the profile of your company with our one-off certification process.